University of Maine at Presque Isle Professor Anderson Giles has led dozens of trips focused on World War II in the Pacific over the years, but it’s not often that these visits to historic battle sites and other points of interest result in coverage from the likes of the Chicago Sun-Times and Fox News. That’s just what happened, though, following Giles’ trip to the Solomon Islands earlier this year. One of the many highlights was that a member of Giles’ group was able to bring home an Army dog tag discovered on a battle site and was able to return it this fall to the family of the soldier. Giles, a professor of art at the university, is passionate about the history of World War II and the veterans who served in the Pacific theater. He has worked for more than 20 years to preserve the history of the war in the Pacific through film, photographs, paintings and other collections, and has traveled to many islands in the Pacific—including Iwo Jima, Tarawa, and Peleliu—to document historical sites and interview World War II veterans about their experiences in order to preserve their memories for future generations. It was through this work that Giles began leading trips to islands around the Pacific like Saipan, Tinian and Guam, sharing the rich history of these locations. This spring, he served as guide and lecturer for a group of veterans, history buffs, and professionals on a unique chartered cruise through the Solomon Islands that visited scenic and legendary cultural and historic sites. The trip, “Return to the Solomon Islands,” was organized by Valor Tours, Ltd., which Giles has worked with for a dozen years. The group walked invasion beaches and former airstrips being reclaimed by jungle growth. They cruised through harbors once filled with warships and found relics on old battlegrounds. While visiting Iron Bottom Sound, where over 100 New Zealand, Australian, American, and Japanese ships lie beneath the water, group member Ron Hosmer laid a wreath in honor of all those who perished and also to honor his father who served aboard the USS Lardner, a destroyer that was involved in many of the battles. Hosmer has been involved in another important memorial endeavor: he served as the construction project supervisor for the new World Trade Center Complex in New York City. Giles recalled that a major highlight of the trip was the opportunity to visit and explore Plum Pudding Island, the island John F. Kennedy and his crew swam to after PT-109 was rammed and cut in half by the Japanese destroyer, Amagiri. Kennedy and the surviving members of his crew clung to the wreckage of the 109 but were eventually forced to swim three miles to the island which today has become an almost mythic location in the region. Members of the group swam in the waters in which Kennedy’s group struggled and some waded ashore to relive the experience of arriving on the island. It was after all of these adventures that something unexpected happened. 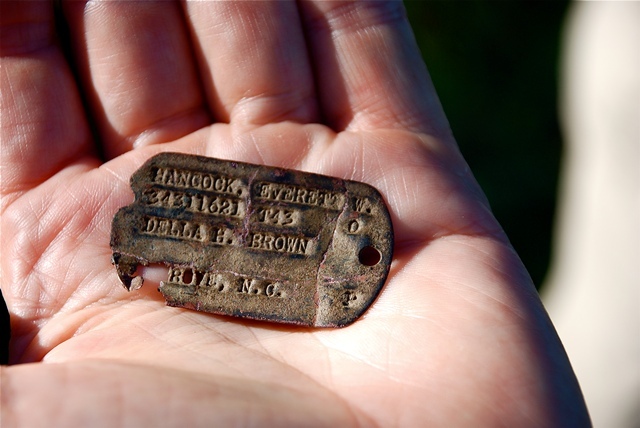 While exploring the infamous Alligator Creek battle site on Guadalcanal and finding rare battle relics, an island youth accompanying the group offered a dog tag he said he’d found on the site the week before. Giles was able to determine its authenticity, so Bill Coulson, a former Assistant U.S. Attorney from Chicago, decided to bring it home and find the owner: Everett W. Hancock of North Carolina. After the trip, Coulson was able to track down Hancock’s son and grandson – the soldier had passed away in 1970. 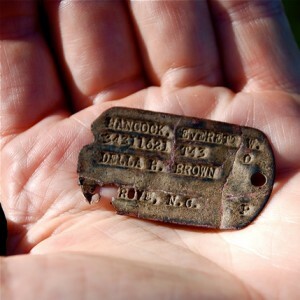 The story was featured in the Chicago Sun-Times and the return of the dog tag to the Hancock family in October, during a ceremony aboard the USS North Carolina in the harbor at Wilmington, NC, was covered by Fox News and other media. Giles noted that every effort to preserve the history of what happened in the Pacific 70 years ago is also a wonderful way to honor the nation’s veterans, and the memories of the soldiers who fought there.